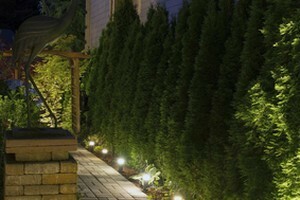 Landscape lighting is a great way to improve the appearance and functionality of your home’s landscape. A great landscape lighting design can make your landscape look even better at night, and our professionals can help you design the perfect lighting scheme for your landscape. Our landscape lighting designs will help you accentuate the most attractive parts your landscape and help to keep your landscape as functional as possible during the nighttime. There are an endless number of options for landscape lighting, whether you’re looking for under-lit trees or a simple light over your garden. At CJS Lawn & Landscaping, we know that artful design is just as important as the mechanical aspects of the job, and our Racine landscapers work hard to make sure that both aspects of the job are done perfectly. If you’re trying to decide between making this a DIY project or hiring a professional landscaper to complete the job, you should start by asking yourself what kind of results you’d like to achieve. The simple fact of the matter is that if you want professional results, you need to hire a professional landscaper. Landscape lighting can be a job that a Racine homeowner could tackle on their own—but if you’re looking for professional results, you’ll have to hire a professional. You could most likely set up a few stand-alone lighting fixtures (with their own limited power sources) in your yard as a weekend project. Our professional landscapers in Racine will be able to work with you to create a stunning and artful landscape lighting design. We’ll make sure that the landscape lighting is a perfect enhancement of your home and your landscape, and we’ll guarantee your satisfaction with our work. Is It Worth It To Pay for LED Lights? Regular halogen bulbs cost about five dollars each, and LED bulbs cost about forty dollars each. However, LED lights can be used for around 40,000 hours before they need to be replaced. That means that you can probably count on LED bulbs lasting for around 20 years with regular use, compared to about 2 years if you’re using standard bulbs. How Should You Design Your Landscape Lighting Scheme? Functionality: The electrical aspects of the job should be perfectly done so that the lights are totally functional and totally safe. Security: Your landscape lighting should make areas around entryways, porches, paths, and patios more accessible at night, and it should help to keep intruders off your property. Aesthetics: Landscape lighting can also help you make your property more attractive. Lighting trees, pieces of artwork, stone paths, or any other exterior features you’d like to accentuate can be an excellent addition to your home. If you’re looking for landscape lighting services in Racine, call CJS Lawn & Landscaping at 262-878-1660, or fill out our online request form.